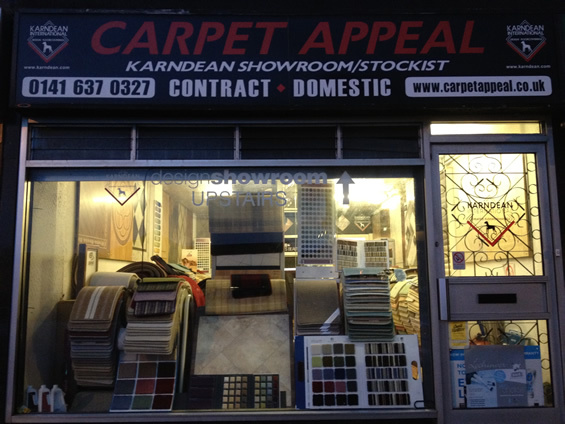 We are a leading floor specialist based in the South Side of Glasgow and offer our products and services to all businesses and homeowners across Scotland. We are an independent family business and with over 75 year's experience, we provide a wide selection of high quality designer floor coverings at competitive prices. Our current reputation has accelerated through providing superior services, quality floor coverings and expert installation. Not only do we offer exceptional high quality and designer products, we also provide an exceptional service. All of our staff are fully trained and well experienced and aim to deliver 100% customer satisfaction. Recent installations include; houses, flats, staircases, hallways, hotels, shops, restaurants, offices, churches, factories and many more. Our shop and showrooms are open: Monday – Thursday – 9.30am - 5.00pm, Friday & Saturday – 9.30am-4.30pm. (Please note if none of the above time are suitable, you can contact us and we can arrange a more suitable time meeting your needs). For further information on any of our products and services please feel free to contact us at anytime.